Target fine lines and wrinkles with retinol. This advanced anti-ageing serum blends pure retinol and potent antioxidants to minimise the appearance of wrinkles, improve firmness and brighten skin. The silky, rich formula leaves skin smooth, hydrated and radiant-looking. I rally don't like the silicon feeling of the product, seems like is sitting on the skin. The product gives some results but noting so impressive. On the other side I've appreciated the fact that doesn't gave me any kind of irritation (just a little tingling upon the first few applications) and helped me to get used to retinol, after a couple of months of continuative use I'm able to use the clinical 1% retinol treatment which used to irritate my skin. Kastana - Love, love, love this! I'm in love with this retinol serum! I've only recently started using PC products and I think i've found my holy grail brand! All the products i've tried really are non-irritant and effective. This serum is my favorite, followed closely by the Omega serum. I'm new to retinol and i feel like I hit the jackpot first time. My skin loves this! Thank you, Paula! I have used this serum mainly after every three nights and the package have lasted a year already. I have just ordered a new one but the pump had broken in the box. Paula’s Choice replaced it with a new serum very fast. You can surely trust the customer service. The serum feels a bit greasy but absorbs surprisingly well. I don’t need to use a moisturizer with this necessarily because I have oily skin. I love how my face looks in the morning when I’ve used this. It feels rested and smooth. I guess there has been improvement in the appearence of lines also. With BHA and retinol I need to be careful because my skin can occasionally get flaky. That happens rarely nowadays. I sampled the trial version. I was quite happy with the results (at least short-term), but can't stand the texture, far too heavy with silicones for my taste. I must be strange but I find the oilier-than-oil texture of silicones really unpleasant on skin. So I won't get the full version. The booster could be a better option but I've had problems with sorbates before. I have got a sample of this absolutely fantastic product just recently. Even after the first application, I could see how good it felt on my skin and how amazing my skin looked. The texture is very pleasant. It easily absorbs and leaves a velvet like feel on the skin. The skin becomes smooth, even toned and my only concern, mimic lines on my forehead - are completely invisible. I usually splurge on skincare products and have used everything from La prarie, chanel, dior, biologique recherche, estee lauder, la mer, etc but this is the first time I have been amazed by the results to the point of wanting to share the experience with others. I will definitely buy this product and would recommend it to everyone. I used this for 2 months, everyday. But does nothing for my skin! Helps fade red marks from past breakouts - has NOT faded past breakouts!!!! This is one of my favourite products, my skin looked great when I was using it. I stopped when I got pregnant and I am not using it yet, because I am breastfeeding, but I can't find a serum or moisturizer that does such a good job on my skin as this one. I will definetely re-use when possible. this is a pretty good product but somehow silicone feels uncomfortable even if no damage and my skin greasy. In addition, keep in mind to mix the product before use. G - Great product, great customer service! I got a free 7ml sample with my order and loved it! It moisturises well and has made my skin much clearer. It didn't cause me any breakouts, so I can use it every night without any extra moisturizer (I have combination skin). I ordered a full size product straight away so that I can take smaller bottle with me on vacations. However, full size bottle pump was not working properly so I contacted customer service, who replied really fast and sent me a new bottle. I love this product. It is working like on descriptions. This size is perfect to test the product for more times and is very easy to take for a holidays or travels. Thank you. I had the same experience as some here, breakouts and worse wrinkles around the eyes. I have succesfully used the skin balancing serum for a year which also contains retinol so I have no idea what's causing the reaction. Customer Care: Thank you for your review. We are sorry to hear of your experience and discomfort. Although this is not a common response, we do understand that each customer is uniquely different in how they will respond to products or ingredients. We thank you for also contacting us by email regarding your experience. I've been using RESIST Intensive Wrinkle-Repair Retinol Serum for 3 years and it really does work and makes my skin healthy and radiant. I'll continue using it! had the same reaction as some people here. Still managing the breakouts it cause me. I had big expectations but did not worked for me. I've been trying to use this product for a couple of months now. Each time I apply it in the evenings, I get breakouts after 1-2 days. If I skip this product, the breakouts are disappearing. And coming back if I restart using the serum. Toni - The best thing ever! Been using this only five nights and can see a visibly difference in my skin! My skin is more radiant ja clearer and pores and blemishes has vanished. The most amazing thing is with the lines, they are already less vissible and the hole skin is firmer. I like that its emollient, so i dont need moisturizer after this. At nights i use pore reducing toner/resist toner and 2 % bha and this serum, mornings use same toners and bha, resist light serum and the new skin balancing spf 30 moisturizer. A little goes a long way and it makes my skin soft and radiant - just like all the other Paula's products I use. I do believe this product has helped A LOT with wrinkles around my eyes and also my decolletage, which was beginning to show a crease - I can see that it's literally stopped it from happening. So big rave for the results. The caveat I referred to is that I think it can give me spots around my mouth and on the chin. I try to counteract this by using it every other evening and generally avoiding the sensitive area. This is a brilliant product which is very well packaged (for maintenance of the active ingredients as well as aesthetics). I have sensitive dry skin and rosacea and have found this to be absolutely excellent for my skin. It glides on smoothly and is quite quickly soaked up by the skin. I have been using PC products for years and have never had any problems with my skin (and most people think I look at least 10 years younger than I am - SPF 30 every day combined with antioxidant serum :-). Worth every penny! Sorry to say but my experience is exactly the same as Barbora.I tried it off and on for a few weeks but every time I had a very severe reaction. I am sure this was caused by the retinol. Customer Care : Thank you for your review. We are sorry to hear of your experience with this product. Although the response you mentioned is not common with this product, we understand that each person will respond differently to ingredients and products. We suggest trying the RESIST Super Antioxidant Concentrate Serum which does not contain retinol. I was very excited when this product came out. 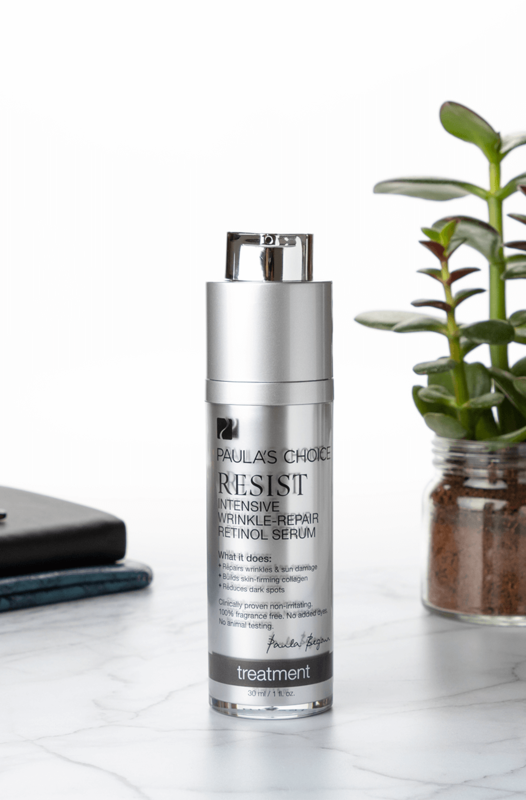 I really like Paulas Choice products, mostly my favourites are the cleanser and toner for dry skin, the resist toner is excellent, resist moisturizer and few others. I have used them while still living in the USA quite a lot and on and off last few years. Always come back to them even when I am tempted to try other brands. I bought 2 of these when they first came out that is how excited I was. Figured it would do a lot of work in one product and make it all more simple for me. The first few times I used it, my face was a bit sensitive but nothing major, figured it is just the first retinol experience and it will pass. I used it only every few days to start slower. However, within the first week I developed some huge cystic acne spots - did not even know what they were since I never experienced this before. I kept using the product, did not even put two and two together. Things got way worse. I finally had to stop using everything on my face to calm it down a bit and slowly tried to fix my skin again. Being a big fan of Paula and given the fact I had two of these products, not totally cheap either, I tried it again - and two more times in about 3 months gaps. The same thing every time - huge cystic acne that really hurt. Gave up. I am only writing this review to let others know that maybe it would be good to test on small patch of skin first for few days before using on your whole face. Everybody has a different skin so it may not be a problem for everybody but my experience was very bad and quite painful...Customer Care : Thank you for your review. We are sorry to hear of your experience with this product. While this response is not typical, we do understand that each customer is uniquely different in how they will respond to products or ingredients. This along with everyday environmental factors can sometimes play a part in how someone will ultimately respond to a product or combination of products.. Please contact customer care with any questions. I love everything about it. The packaging is really chique, the serum smells lovely and is easy to use. The best bit is that it works wonders. I have been using other Resist products for a while, so my skin already looked very good for its 49 years of age but this serum adds more benefits: It plumps the skin even more and makes it look yet younger. What more to ask for? It is difficult to determine when to order a new bottle as it is impossible to tell how much of the product is used up. I would hate to run out of it so next time I will order two at once. I was already in love with the RESIST Super Antioxidant Concentrate Serum, but this product combines the best features of it with the power of retinol. I use it every night, starting with the weekly resurfacing treatment, then the retinol serum. Wow, if feels so great on my skin, and the best part is that in the morning I wake up with hardly any wrinkles on my brow! It definitely has a tightening effect on my face. And after only a week of using it I can already see some improvements in my wrinkles. My 47 year old face loves it. I was using a retinol product before this, but it used to irritate my skin so that I could only use it for a few days at a time then needed to take a break, but I don't have that with the resist retinol serum. The only problem is that I have other expensive night creams in my bathroom that I should use up, but every night I can't bear to put anything else but Paula's Choice serum on my face! Please never stop making this and thanks for keeping the price so reasonable. 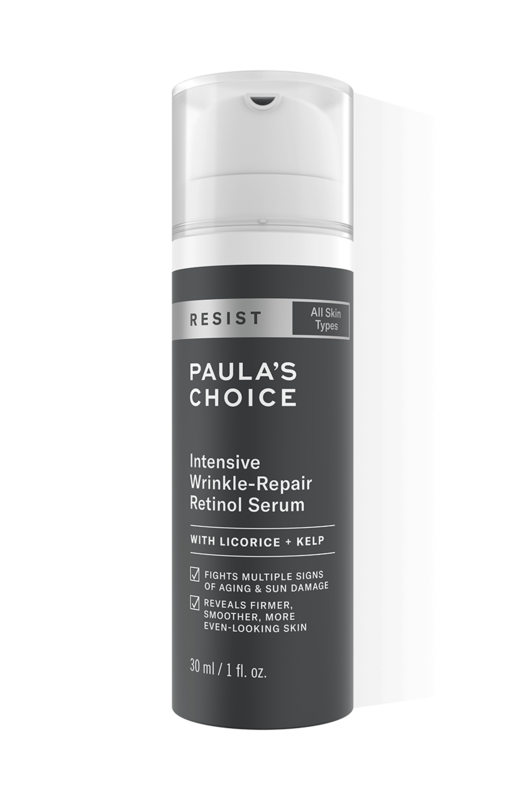 How does Resist Intensive Wrinkle-Repair Retinol Serum differ from the other Antioxidant Concentrates that Paula's Choice offers? The most notable difference is that Resist Intensive Wrinkle-Repair Retinol Serum contains a higher amount of retinol than our Skin Recovery and Skin Balancing serums with retinol. The Resist Super Antioxidant Concentrate Serum does not contain retinol and as such is an excellent serum to alternate with the Intensive Wrinkle-Repair Retinol Serum. Both of the Resist serums were designed for all skin types, whereas Skin Recovery Super Antioxidant Concentrate Serum is best for normal to very dry skin and Skin Balancing Super Antioxidant Mattifying Concentrate is best for normal to oily or combination skin. Every Paula's Choice Super Antioxidant Concentrate Serum is silicone-based and contains an effective blend of antioxidants, skin-repairing ingredients, and cell-communicating ingredients to restore skin and significantly reduce wrinkles, increase collagen production and improve skin tone. Yes, you can use Resist Intensive Wrinkle-Repair Retinol Serum with a prescription retinoid but generally speaking, you don't necessarily need to. Many will do fine with one or the other, or you can apply the prescription retinoid at night and apply the retinol product during the day, always being sure to protect your skin with a product rated SPF 30 or greater. Keep in mind that using multiple retinoid products increases the risk of irritation, which is never the goal. With retinoids, more is not automatically better!